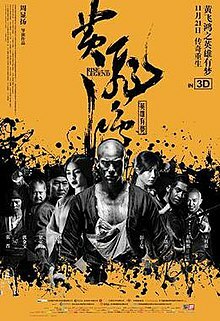 Rise of the Legend (Chinese: 黃飛鴻之英雄有夢) is a 2014 Hong Kong-Chinese kung-fu action film directed by Roy Chow and written by Christine To. The film stars Sammo Hung, Eddie Peng, Wang Luodan and Jing Boran. It was released on 21 November 2014 in China. Principal photography on the film began on 20 August 2013 in China. Edko Films, Irresistible Films, and Universal Pictures International are producing the film, while Edko Films will release the film in China and Universal will distribute the film Internationally. The action director is Corey Yuen. Sammo Hung as Master Lui, leader of the Black Tiger gang, Main Villain. Eddie Peng as Wong Fei-Hung, a future revered folk hero, joined the Black Tiger gang to take it down within by climbing into the top four tiger rank with the help from his friends from the outside. Angelababy as Xiao Hua, a courtesan, revealed to be the long-lost childhood friend of Wong Fei-Hung, died near in the end of the film in helping Fei-Hung in her own way. Jing Boran as Fiery, Wong Fei-Hung' childhood friend and admirer of Chun. He helps Wong Fei-Hung take down the Black Tiger gang from the outside. He died sacrificed himself to keep Fei-Hung from getting his identity as a mole in the Black Tiger Gang from exposed. Zhang Jin as Wu Long, the son of the North evil who try to avenge his late father's death caused by the Black Tiger Gang. He was killed by Master Lui while Fei-Hung tries to spare his life. Wong Cho-lam as Big Tooth, Good friend of Wong Fei-Hung, a former member of the Black Tiger gang who joins Fei-Hung on his mission to take down the Black Tiger Gang. Jack Feng as North Evil, Leader of the Northern Sea. Rival of Master Lui. Killed by Wong Fei-Hung in the beginning of the film to raise his rank in the Black Tiger Gang. Over the years, the tale of Wong Fei-Hung’s heroism has transformed him into a revered folk hero and is widely portrayed in modern media. Arguably one of the most recognizable kung fu figures in cinematic history, he is the subject of over 100 films and television series since the 40s. The character is further made famous on the big screen by kung fu superstars Jet Li and Vincent Zhao in the highly successful Once Upon a Time in China series (1991 – 1997) as well as Jackie Chan in Drunken Master I and II, and excluding III with Willie Chi taking over (1978 – 1994). Wong Fei-Hung played by Eddie Peng is a young man at 21 years old who is destined to become a master of his time, and an everlasting legend in the world of martial arts. In 1868 during the late Qing Dynasty, in Guangzhou, two crime factions run the Huangpu Port: The Black Tiger and the Northern Sea. For years, the Black Tiger’s fearsome boss Lei Gong played by Sammo Hung has been trying to get rid of the leader of the Northern Sea. One of his latest recruits is Wong Fei-Hung, a fearless fighter who takes the Northern Sea leader’s head after a fierce fight. Recognizing Fei-Hung’s talent, Lei Gong makes the young warrior his godson and one of his Four Tigers, the most trusted men in the gang. There is more to young Fei than meets the eye and the truth about his past and the ultimate showdown soon unravels. On 19 August 2013 it was announced that Edko Films, Irresistible Delta and BDI Films were teaming up for an upcoming action film based on life stories of the legendary martial arts master Wong Fei-Hung. The producers would be William Kong, Liu Erdong and Ivy Ho, while director Roy Chow would be directing on the script by Christine To. On 12 June 2014 it was announced that Universal Pictures International acquired all international rights to the film, including North America and Edko Films will distribute the film in Asia. It was also announced that the film was in post-production, which Universal would be co-producing along with Edko Films and Irresistible Films. The shooting of the film began on 20 August 2013 in China. ^ "2D Rise Of The Legend". Pacific Place. ^ "Rise Of The Legend". Cathay Cineplexes. ^ "Weekly box office 08/12/2014 - 14/12/2014". english.entgroup.cn. Archived from the original on 16 December 2014. Retrieved 1 April 2015. ^ 《黄飞鸿之英雄有梦》首曝预告定档11.21 彭于晏亮狠辣拳脚 王珞丹首尝"持刀杀人". mtime.com (in Chinese). 10 August 2014. Retrieved 11 August 2014. ^ a b Chu, Karen (19 August 2013). "Hong Kong's Edko Films Unveils Kung-Fu Project 'Rise of the Legend'". The Hollywood Reporter. Retrieved 12 June 2014. ^ Tartaglione, Nancy (12 June 2014). "Universal Pictures International Boards Chinese Kung-Fu Pic 'Rise Of The Legend'". Deadline Hollywood. Retrieved 12 June 2014. ^ Barraclough, Leo (12 June 2014). "Universal Pictures Intl., Edko, Irresistible Team on 'Rise of the Legend'". Variety. Retrieved 12 June 2014.